Dust it hot for a great cause! Being part of the community has always been a goal for Dizzy Pig, and the release of Spicy Dizzy Dust was the perfect time for us to support one of our favorite charities! Through Dizzy Pig’s popular Manassas, VA location, we get a chance to meet a lot of great people in the community. One of those people is Larry Zilliox. He is the Culinary Services Director for Serve Our Willing Warriors, which has become a charity that is close to our hearts. And we’ve gotten to know Larry well over the past few years. Larry invited us to tour the Warrior Retreat at Bull Run, which gives wounded soldiers, often suffering from Post-traumatic stress disorder (PTSD), a place to escape the sometimes brutal recovery process. As we met many of the caring volunteers, we knew we wanted to get more involved. We’ll be donating a portion of every bottle of Spicy Dizzy Dust sold for this amazing cause. Dizzy Dust is our flagship seasoning, dating all the way back to 2002. The familiar orange bottle has seasoned tons of food, and we don’t see its popularity waning. People love our spicy Swamp Venom, Jamaican Firewalk, and our seasonal Ghost chiles seasoning. But what if we took our delicious Dizzy Dust and kicked it up a few notches for those that crave a little burn? After some quality time in the test kitchen, we’re pleased to announce the release of Spicy Dizzy Dust! It is really not just Dizzy Dust with heat. You can really taste the fruitiness of the chiles before the heat hits you. What is Serve Our Willing Warriors’s mission? Our mission is to provide cost-free retreat stays and other programs that positively impact the lives of wounded, ill, or injured military service members. We inspire and lead communities and volunteers to improve the lives of military service members and families adversely affected by service to our Nation. Our vision is to serve as many military service members as possible across the Nation. The Warrior Retreat at Bull Run is the flagship program of Serve our Willing Warriors. It is a place where service members recovering at military hospitals around the National Capital Region can go to get away from the hospital environment. The average hospital stay is 300 days, and that takes a heavy toll on everyone involved. Their main focus is to rejuvenate service members by providing a relaxing environment where they can spend quality time reconnecting with their family and friends. The Retreat is located on 37 acres in the scenic foothills of the historic Bull Run Mountains of Northern Virginia. The most frequently used adjectives by guests and visitors are “beautiful” and “peaceful”. The view from the property includes the historic Bull Run Mountains just a short distance away. Common sightings on the property include deer, fox, groundhogs, and hawks, with occasional appearances of wild turkeys and bald eagles. The newly renovated and spacious lodging house includes full handicapped accessible features with many wonderful amenities. Their Guest Services Program includes a full menu of 60+ great activities. One of the highlights of the program is a custom-ordered, gourmet meal on Sunday afternoons. Guests are treated to signature dishes prepared and served by one of 40+ professional chefs and their volunteer assistants from the Visiting Chef Program. Every attention to detail is considered to make warrior families feel extra special. The objective is that everyone returns to the recovery process feeling refreshed, inspired, and motivated to succeed in rebuilding the lives they wish to lead. 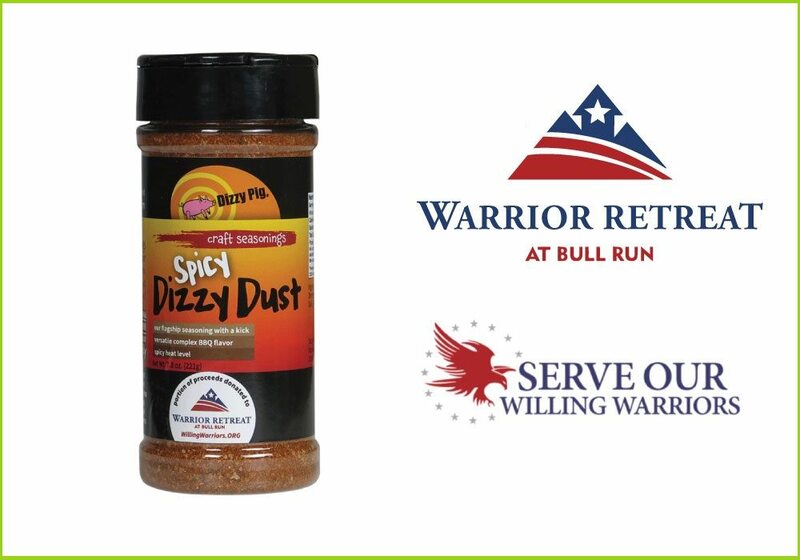 Get some Spicy Dizzy Dust, and you automatically help support the cause. You can also donate directly.